It was our pleasure to speak via Skype with Seattle guitar teacher, Joe Walker, recently, as we continue to be inspired by the level of sincerity and passion for teaching guitar that each guitar teacher we’ve interviewed has demonstrated. You can watch the interview in its entirety on Joe’s guitar teacher page. Lessons.com: We’re here today talking with guitar teacher Joe Walker, who has a profile on Lessons.com. Hello, Joe, and thanks for taking the time to talk with us today about your guitar teaching. Joe Walker: Hi, James. Thank you very much for inviting me. 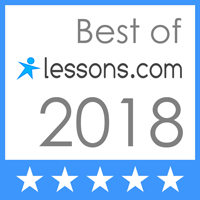 Lessons.com: It’s a pleasure to be here with you, and I look forward to hearing about your teaching. First off, can you tell us where you teach – what city you’re in and what state? Joe Walker: I’m in Seattle, Washington. Lessons.com: And do you teach in your guitar students’ homes or do they come to you? Joe Walker: I teach primarily right here in this room. This is my home studio. I used to teach guitar in students’ homes, but I don’t currently offer that. I do also teach Skype guitar lessons, so I do that right here on the webcam, and I can teach pretty much any student all over the world. Lessons.com: And if someone wanted to contact you about Skype lessons, how would they do so? Joe Walker: They can contact me through my website, which is deftdigits.com, or, obviously, my Lessons.com.com profile. Lessons.com: Very cool. And can you tell us about the guitar lesson climate there in Seattle – do you find that there are a lot of people there that want to learn guitar? Joe Walker: Yeah, I do. It’s pretty fun. It’s a very musical city, and there’s people learning all kinds of different instruments. I find that guitar is a really popular one, and I’ve got several students ranging from age five all the way up to retired adults and just across the board – it’s a very popular instrument. Lessons.com: And what styles of music do you find your students most often interested in learning? Joe Walker: The most popular styles, I’d say, would probably be classic rock or modern pop music. A lot of the younger kids are really into whatever they hear on the radio, so they want to learn how to play the latest Calvin Harris tune on guitar … or something like that. So yeah, those would be the main … the most popular genres, and I do several others as well. Lessons.com: And in simple terms could you describe your guitar teaching approach? What’s your focus with each individual guitar student? Joe Walker: The focus is always what gets the student the most excited about practicing and playing and progressing on guitar. So, most of the time, that means finding out what their favorite music to listen to is, and see if we can find a way to put that on the guitar. Even if they’re a total beginner, find a way to adapt it in a way that’s easy for them to play, and they can get really excited about playing guitar and practicing. So, it’s a very individual approach for every different guitar student. Lessons.com: That sounds great, Joe, so that type of approach – kind of get people playing songs as quickly as possible – especially songs that they enjoy. Joe Walker: Absolutely! And then go … dig into the theory and the technique from there – whatever theory they need to apply for their own music that they’re pursuing. Lessons.com: And how long are your guitar lessons? Joe Walker: My lessons are all fifty minutes long. That leaves me a little buffer between lessons to make sure that I’m never running late, so lessons always start on the hour, and then I’ve got that extra ten minutes where we can go overtime when we need to. Lessons.com: And tell us a little bit about your fees and your scheduling format. How often do you work with your guitar students? Joe Walker: I encourage all my students to do weekly lessons – find a time that they can reserve to come every week, and they can cancel and reschedule those lessons as they see fit. For fees, I charge $80 for a guitar lesson, and then, if you can lock down a time where you’re coming every week, I discount it to seventy per lesson. Lessons.com: And do you find that students make more progress when they’re meeting with you at a regular time? Joe Walker: Absolutely – especially the younger guitar students, because if they go too long between guitar lessons, they either end up building some bad habits that could have been weeded out with a more regular lesson, or they end up getting bored with something that they’re practicing too often. So weekly lessons … even if it’s … sometimes I have a couple guitar students who split that fifty minutes, like siblings or a father and son or something like that … if they can come in every single week, then that’s usually what gets the best results. Lessons.com: That sounds very good, Joe. And tell us a little bit about your equipment. When you’re teaching guitar, what guitars do you use? Are there particular acoustic or electric guitars that you find you teach with more often? Joe Walker: I find that I teach with my acoustic guitar a lot more often than I used to play it before I was in lessons, both because many of my students play acoustic, probably more acoustic than electric guitar, and because it’s convenient to not have all the extra gear. But, I also use this one a lot – this is my Les Paul, and I have it plugged into a gaggle of pedals behind me, and I have several amps – I also teach bass lessons – and a couple of guitar amps in here. Lessons.com: Very cool … and I noticed on the wall, behind you – behind your right shoulder- there’s a banjo. Do you also play the banjo? Joe Walker: A tiny bit. That’s my dad’s banjo; I’m borrowing it from him right now. I’m learning it right now. Lessons.com: Very cool to see it there in the room with you. And, do you offer guidance to your guitar students about purchasing a guitar? Joe Walker: Of course – especially for the starting-from-scratch beginners, who often have no idea what kind of guitar to get, so depending on what kind of music they’re into, and how old they are, how big their hands are, I can provide advice on where to go to get a guitar, or what kind to look for, and what to ask the sales people. Lessons.com: That’s wonderful, Joe, and we’ll be finishing the interview in a minute, but I wanted to ask you if you’d like to play something for viewers of the video. It doesn’t need to be something that you would show a student … more something maybe that you would enjoy playing when you sit down with the guitar … maybe a segment of a song – it would be great to hear. Joe Walker: Of course. There’s something I’ve been working on recently – it’s part of the solo from Back In Black. So let’s see what happens when I try that right now. Lessons.com: That sounds great, Joe. Always a good song to hear. It never gets old. Lessons.com: So thank you again for taking the time to be in this interview; it’s wonderful to learn more about your guitar teaching, and I want to wish you the best of luck in your guitar teaching in the future. Joe Walker: Thank you very much. Lessons.com: Alright, Joe. Take care and good luck again.